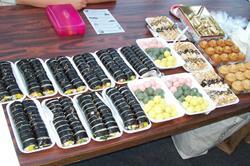 Korean sushi and other goodies, free for the sampling. 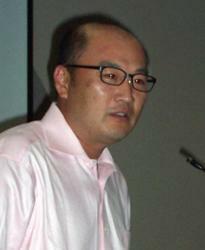 Jae Han, son of Boo Han, who opened the first Korean market in Pierce County in 1973. 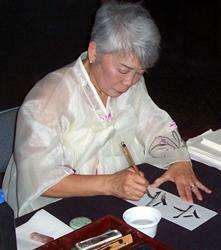 Patsy Suhr O'Connell, demonstrating traditional Korean calligraphy. Korean Community Shares Culture, Stories of Striving and Success in Lakewood. Lakewood is fortunate to have a vibrant, well-established Korean community, one that is willing to share its heritage and centuries-old culture with its neighbors. And if the size of the audience at the Lakewood Historical Society's September Monthly Program is any indication, a lot of those neighbors are equally willing to listen, share--and participate--in that culture. Tuesday evening, September 18 at St. Mary's Episcopal Church on Gravelly Lake Drive, over 85 attendees of the Society's program, The Influence of the Korean Community on Lakewood’s History, roamed through Parish Hall. They sampled delicacies, including Korean-style sushi (one defining characteristic: all fish is cooked, this correspondent was particularly happy to learn), had their names rendered in Korean by well-known artist and calligrapher Patsy Suhr O'Connell, and learned to fold cranes and other paper objects d'art from origami instructor Dongsu Litchfield. These activities and more were thanks in large part to the generous participation of the Asia Pacific Cultural Center (APCC) and its Executive Director, Lua Pritchard. Earlier, the evening had begun with a dramatic flourish: traditional Korean drumming as performed by Savanah Kwok of the North-west Korean Dance Academy. Jae Han, owner of Boo Han Market, one of the largest businesses in the International District on South Tacoma Way, told of his father's whole-hearted pursuit of the opportunities he found in America. Boo Han established the first Korean grocery in Pierce County soon after his arrival from South Korea in 1973; now plans are afoot for an entire Korean shopping mall behind the current market. The market is visited regularly by customers from as far away as Eastern Washington and Idaho. Patsy Suhr O'Connell, President and Founder of APCC, spoke of her early life in Korea and subsequent experiences in the US, and the motivation behind her founding of the Center. Eunice Jung, President of the Korean Women's Association, shared the KWA's purpose and history since its founding, 40 years ago this year. Connie Coleman-Lacadie, Chairperson of City of Lakewood's Sister Cities Association, spoke of Gimhae, the South Korean Friendship City for Lakewood. She also displayed traditional musical instruments, artworks and other Korean cultural artifacts. All in all, the evening was a grand introduction to the influence of a vital community (over 500 businesses in Pierce County alone!) for some, a hearty reaffirmation of a mutually beneficial relationship for others.